A logic puzzle game consisting of over eighty puzzles involving manipulating numbers. In Cotrio, you fill round fields with three random numbers so that the sum of the first two equals the third one. 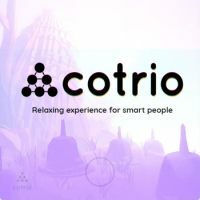 Cotrio for is a logic puzzle game by indie Polish developer Bartosz Bia³ek. Cotrio consists of over eighty puzzles involving manipulating numbers. The game takes place on a board with six round fields, which you need to fill with three random numbers so that the sum of the first two is the third one. When the calculation is arranged correctly, the field with the result lights up and you can focus on the rest. The puzzle is solved when the whole pyramid is filled with numbers. Things are made more difficult by the fact that the fields next to each other cannot be filled with the same numbers, and each puzzle consists of a given number of calculations. The gameplay of Aderyn's Cradle is based on various video game genres. At the start, you choose one of the available character classes with unique abilities. There are four open worlds to explore. One of the main aspects of the game is the crafting system allowing you to create health and stamina potions. To craft them, you need to combine the ingredients you find in the right way. You can use the hit-and-miss method, but there are also recipes to be obtained during the game. In combat, you use a variety of weapons an armor, while the melee combat calls for strategic thinking. The game features both a singleplayer mode and a multiplayer mode. Cotrio features simple 2D visuals. However, it features over thirty picturesque backgrounds to make the calculations even more pleasant. You can also look around them and take photos of them using the app's system. There are two difficulty levels, allowing you to adapt the challenge to your math skills.